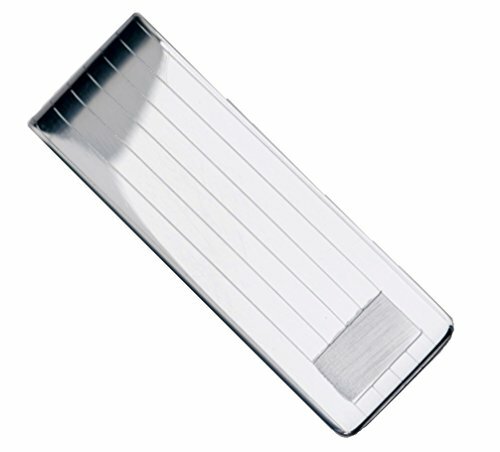 Sterling Silver .925 Money Clip, Made in Italy, Solid Design, Engravable, Weight is approx 23.9, measurements are 2 1/4" by 3/4"
✔ Luxurious look and feel, keep bills and credit cards together with style. No extra pocket bulk, a modern alternative to bulky wallets. ✔ Free Elegant Metallic Silver Jewelry Gift Pouch. A perfect gift for a Graduation, Bachelor Party, Wedding, Corporate Event, Anniversary, Father's Day, Christmas. ✔ Sterling Manufacturers is committed to customer satisfaction. Established in 1996, we specialize in contemporary fine jewelry. Whatever item we sell, we want our customers to be happy with the quality of the item along with the excellent price. Check out our entire extensive collection!